Founded in 1970, Broward Nelson Fountain Service has been servicing the needs of the South Florida restaurant community for nearly forty years. 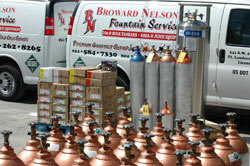 Starting as a two-truck, family-owned operation serving Ft. Lauderdale to over seventeen trucks serving all of Dade, Broward, Palm Beach and Martin counties, Broward Nelson Fountain Service is the leader in beverage supplies. We believe in the “one-stop-shop” where one call takes care of your gas, syrup, service and equipment needs. From our courteous, knowledgeable delivery personnel to our highly trained service department, let us show you what our customer service is all about. During business hours we personally answer every call so you will never have to worry if your message was received or if your order will come out correctly. The owners are personally available to you everyday to handle any problems you may have. Our night crew is on hand to handle out-of-gas and emergency service issues after the office has closed. We provide emergency service 365 days a year. Once again, “customer service” is our mission. 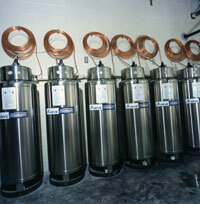 We offer CO2 (both high pressure and Bulk), as well as beer mix, nitrogen, and helium. All gases (except helium) are available in both 20 lb. and 50 lb. sizes. We are an authorized Coca Cola distributor and carry a complete line of their high quality flavors, as well as a complete selection of our own Broward Nelson Premium Gourmet Syrups, which bring you a high quality product at a better value. This gives you extra profit without sacrificing quality. Not only do we have a wide choice of soda syrups, but we carry the highest quality post-mix juices you will find anywhere. In addition to orange, cranberry, pineapple, and grapefruit juices we also carry Lemon-X Sour Mix (the gold standard in the industry). We can show you how to improve your bottom line with our Bag-in-Box Energy Drink SIN (Super Intense Energy), all the flavor and kick of that national product at a fraction of the cost. Our service department brings a combined 135 years of experience to your location. We are radio dispatched and GPS equipped to get to you quickly. Your time is too valuable to waste, so we pledge to get you back in business on the first trip. Our trucks carry a complete stock of the most needed parts and fittings, and we are qualified to work on all types of equipment, be it soda fountains, juice dispensers, or Bulk CO2 systems. Installation of new and refurbished dispensers for your business or home is available. Give us a call and let us come by and show you how Broward Nelson Fountain Service can make your beverage dispensing problems disappear. Give us a call; you will never talk to a machine. Customer Service is our mission.